The Student Loan Scam is an expose of the predatory nature of the $85-billion student loan industry. In this in-depth exploration, Collinge argues that student loans have become the most profitable, uncompetitive, and oppressive type of debt in American history. This has occurred in large part due to federal legislation passed since the mid-1990s that removed standard consumer protections from student loans-and allowed for massive penalties and draconian wealth-extraction mechanisms to collect this inflated debt. High school graduates can no longer put themselves through college for a few thousand dollars in loan debt. Today, the average undergraduate borrower leaves school with more than $20,000 in student loans, and for graduate students the average is a whopping $42,000. For the past twenty years, college tuition has increased at more than double the rate of inflation, with the cost largely shifting to student debt. Collinge covers the history of student loans, the rise of Sallie Mae, and how universities have profited at the expense of students. The book includes candid and compelling stories from people across the country about how both nonprofit and for-profit student loan companies, aided by poor legislation, have shattered their lives-and livelihoods. With nearly 5 million defaulted loans, this crisis is growing to epic proportions. 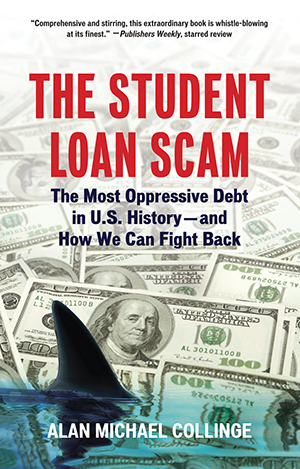 The Student Loan Scam takes an unflinching look at this unprecedented and pressing problem, while exposing the powerful organizations and individuals who caused it to happen. Ultimately, Collinge argues for the return of standard consumer protections for student loans, among other pragmatic solutions, in this clarion call for social action.